Has anyone seen this? It appears as if something is wrong with the BIOS. Is it fixable? Seems like the BIOS is set to PXE, network boot. PXE booting is used to mass deploy operating systems. Its failing because the laptop does not have a network cable connected. Go into the BIOS to check boot order, f10 or del key, depending on the BIOS. Does this happen all the time? In order to boot into PXE manually you’d have to hit f12. 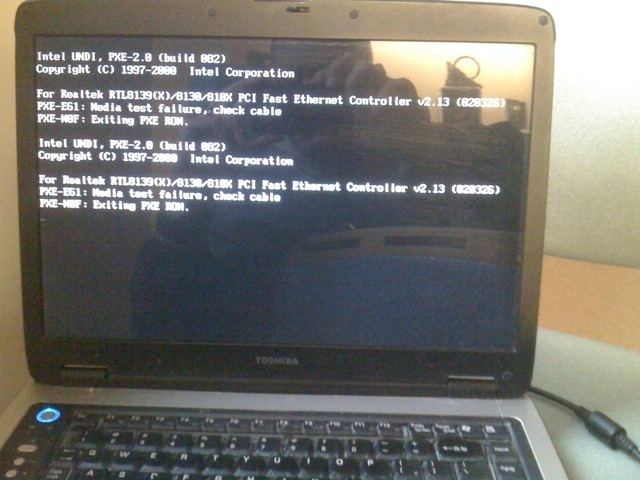 Jim– I went into the BIOS and disabled Network Boot, which was the 4th option. Now it says “operating system not found”. Re-activated network boot and the original error appears. I have never had this machine set to boot from a network. West Penn make me log on to their network when I want to use the Internet, and the computer shut down in that state. But that should not change the BIOS, should it?